In March 2015, after five years as a Division I Athletic Director, I started on a new path. For the first time in a long time, I had time to stop moving, reflect, and think deeply about our profession and the student athletes that we serve. College athletics is a relentless existence regardless of your position. Student athlete time demands have never been greater; head coaches face unending scrutiny and the expectation of instant and permanent success; and athletic administrators spend their days putting out fires and answering to everyone - University administrators, Trustees, coaches, staff, students, parents, and the media - while barely seeing their own families. I spent several months developing numerous ways to support friends and colleagues in intercollegiate athletics. My goals with each endeavor are to address the unrealistic and relentless demands on senior athletics administrators; mitigate risk; save financial resources; reduce staff time and frustration; and enhance the student athlete experience. While some concepts are still in production, others are already adding value to my colleagues in this field. Through my consulting, I've been able to assist a number of coaching friends achieve their first head coaching positions. It has brought me immense personal satisfaction seeing good people with great values join the ranks of the coaching elite. They are individuals who will help student athletes excel - in sport, the classroom and life - and will make headlines for our field for all of the RIGHT reasons. In addition, we developed and launched Athlete Viewpoint. 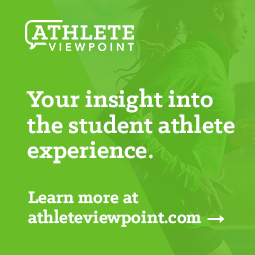 Athlete Viewpoint is your student athlete survey turbocharged and designed to yield maximum data to make your life easier. In addition, you can compare the views of your student athletes to those of student athletes across the country. I'd encourage you to click on the link and check it out for yourself. And if you are reading this as one of our early adopters who have already signed on, thank you! We are excited to see the impact you can make on your campus with this valuable information. Author and entrepreneur Seth Godin writes frequently about building a tribe of like-minded individuals. If you are reading this blog on a regular basis, you are part of that tribe. Thoughtful, philosophical, curious and dedicated to providing every student athlete an opportunity for both a distinctive education and a championship experience. Like many of you, I've been in college athletics a long time and I've seen many changes to our field - not all of them good. Through the Ultimate Sports Insider and these other new initiatives, I hope to continue the conversation with you all about how to best support each other, and enhance the good work that is taking place in athletics today.